I love visuals and visual schedules. If you don’t know that by now, you MUST be new here! 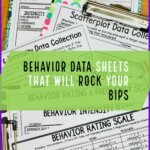 I love them because they can prevent so many challenging behaviors and keep students (and staff) so much more engaged. So my mind is always blown when I meet someone who doesn’t think a student should use a schedule. Lets face it, we all use schedules. I have a planner and a calendar and a to-do list–those are all types of schedules. I’m betting if I took away your calendar or planner for a few days, there would be a lot of appointments missed, children’s events missed, and so on. We rely on our visual supports–we just don’t call them that. 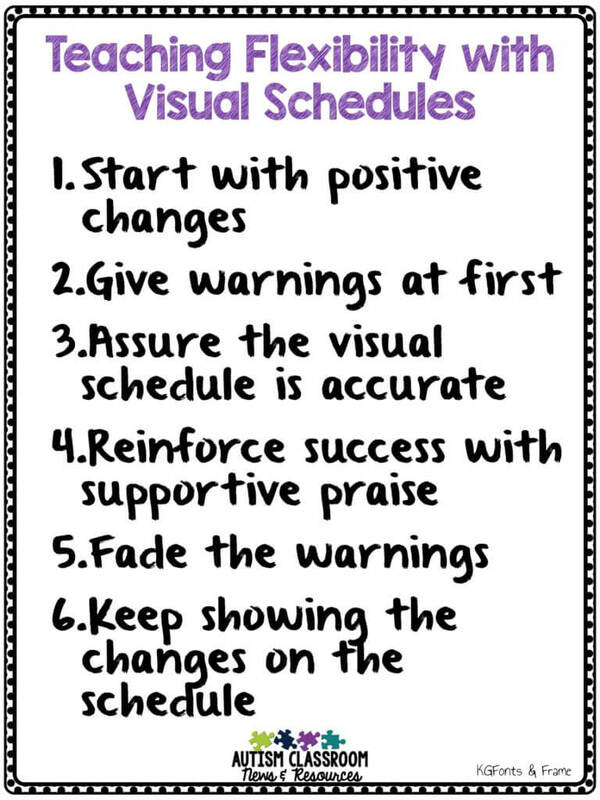 Typically when someone tells me they don’t want a student to use a visual schedule it is because they feel like it will make the student’s behavior more rigid. Let’s face it, many times our students’ behavior can be pretty inflexible. But what gets me is that people think it’s the visual schedule that is making or going to make their behavior rigid. It isn’t the schedule…it’s the instruction and the way it is used. 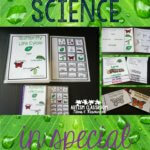 In fact, visual schedules can be used to help students be MORE flexible. You just have to use them effectively with that goal in mind. 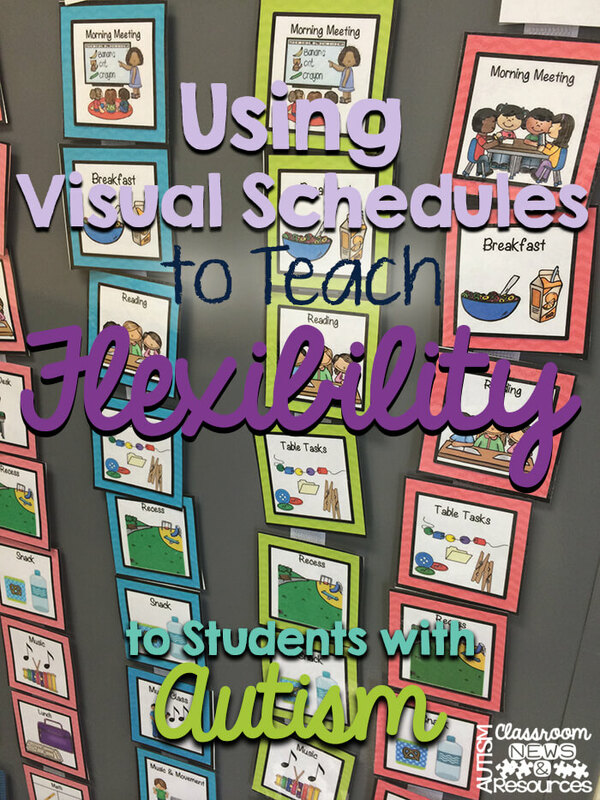 Visual schedules can help students with #autism be MORE flexible. It certainly is true that schedules can be pretty rigid and we are as guilty of wanting to stick to them as our students are. However, if we teach a student to use the schedule independently and effectively, we can teach flexibility within it pretty easily. We can teach students to be more flexible whether they are using a picture schedule, a photo schedule, an object schedule or a written schedule. Because it’s not about the form of the schedule, it’s about how we use it. First, you need the student to be able to use the schedule primarily independently and know how it works. He or she needs to be able to look at the series of visuals/pictures/words and see what is going to happen during the day. This is because unless he understands how it works, you can’t teach him that the schedule sometimes changes. In other words, until I know the right way to do something, I can’t modify it effectively. Imagine if you tried to teach addition to someone if you only knew the rote addition facts but didn’t understand that addition involved combining sets of numbers/materials. Until you can break it down, you can’t teach variations. Once the student understands how a schedule works, then we can start to make changes to it. Yes, because we are teachers and we know that nothing can ever be easy. 🙂 Some changes obviously happen naturally (e.g., no outside recess today because it’s raining). However, to make it effective, start with a change that is not upsetting (e.g., don’t cancel computer for the day unless you are ready to ride it out). We want change to not be seen as always something negative. So perhaps, your first change would be to add something to the schedule that the student likes. For instance, today we are having a popcorn party instead of afternoon meeting! This keeps changes from being something that are dreaded because they are typically unwanted (e.g., what kid wants to not have computer because it’s broken?). Clearly we need to get to times when warnings of changes aren’t the norm–because that’s the way life works. But remember, we are TEACHING flexibility–not expecting it. The teaching piece means we are breaking it down into small steps and teaching them sequentially just like we teach getting dressed and doing a math problem. So, at the beginning, let the student know that there is going to be a change. You might talk about the change when you go over the group schedule. Or you could show it to him when he checks into his schedule first thing in the morning and then review it periodically during the day. You might have a “change board” in the classroom that you put the group visual like the one below. Give another warning just before the changed activity happens. 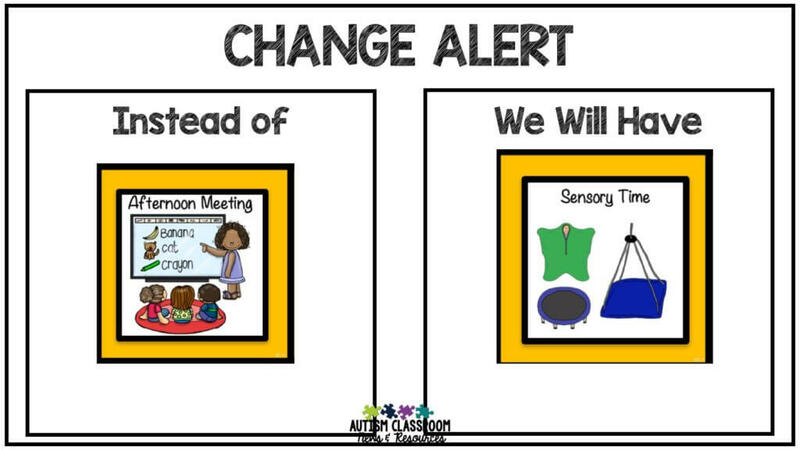 This will help the student remember the change and prepare for it. Changes are so much easier for all of us if we have time to prepare. Changes are so much easier for all of us if we have time to prepare. Whatever you do, make sure that the schedule has the visuals on it that go with the new activity. In other words, make sure it’s accurate. Otherwise the change will seem deceptive and the student won’t be prepared. The whole point of the schedule is to help him prepare for the activities of the day and navigate them independently. If it’s wrong, it doesn’t do that. I know I get flummoxed when I have something on my schedule at the wrong time–it adds stress beyond the fact that you missed an activity. Even if at first the success is that the meltdown wasn’t that long, reinforce the student for managing the change. Again, if he just gets through the change but maybe doesn’t participate–that’s a win if he usually has a meltdown. Take small steps and reinforce getting closer to his accepting that things change. This is hard work for him–reinforce approximations of what you want to see with tangible items or activities as well as praise. Make sure to praise specifically for handling the change well. Use statements like, “I like how well you managed it when we changed the schedules.” “Change can be hard but you are doing a great job!” “You are so brave handling that change in the schedule without getting upset! Go You!”–this one is particularly useful if the student is highly anxious about change. Try to avoid saying things like, “See change isn’t so bad” as that belittles the student’s feelings of frustration or anxiety. Instead use supportive statements that reinforce the behavior you want to see. When he is able to manage the changes with warnings and advance notice with few difficulties, start moving the warning closer in time to when the actual change is going to happen. For instance, instead of telling him about the popcorn party in the morning when he arrives, tell him at lunch time that it will be happening at the end of the day. Then slowly move these times closer to the time of the change. This will begin to be more like situations in which you don’t have advance notice (e.g., the art teacher just went home with the flu so art class is cancelled). Over time as you get closer to the change, the warnings will naturally fade out. Even if you run to the schedule seconds before the change is going to happen, keep changing the schedule to reflect the change that will occur. This keeps the schedule as something the student can rely on to be accurate. I can’t tell you how many times I’ve sent someone back to the schedule really quick to switch out the visuals so we could change up the day when needed. That’s life. Over time, the student may come to make the change to his schedule himself. For instance, I have some students who, when they find out about a change in the schedule, cross it off their written schedule and write in the new activity on their own when it’s announced to the class. 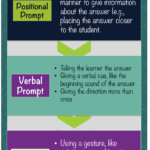 Using these steps can help students to accept that changes will happen and that they can manage them. 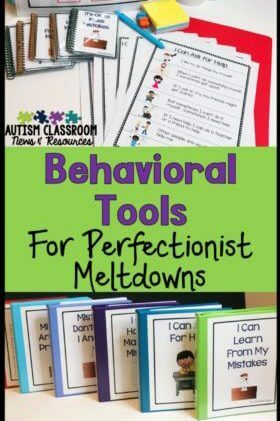 You can combine them with the use of visuals about expectations of behavior or coping strategies, like my calm down strip in my I Can Stay Calm Social Narratives and Visual Supports. Feel free to save the picture with the steps for future reference or pin it for later. Have you taught students to be more flexible? I ‘d love to hear about it in the comments! 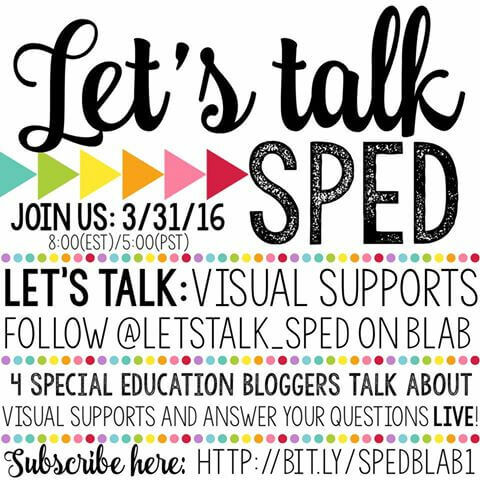 And don’t miss the next SPED Blab. We have taken over an identity on BLAB so we can do one every week. 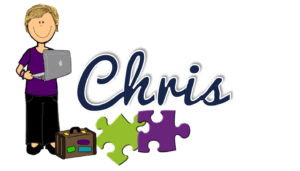 Check out last week’s BLAB if you missed it. Check the directions below and the link to join our next one on Thursday night (3/31) at 8 PM eastern. Or click the picture below and you can subscribe!! We are sharing visual supports we love and how we use them! See you there!